This is very welcome timing, because it means this piece has reached its readers just in time to alert them to one of those events – my own Commemorating Augustus conference – with two days still to go before late booking fees kick in. If you haven’t booked your place yet and would like to do so, you have until midnight on 16th July to get yourself set up! Full registration and payment details are available here. 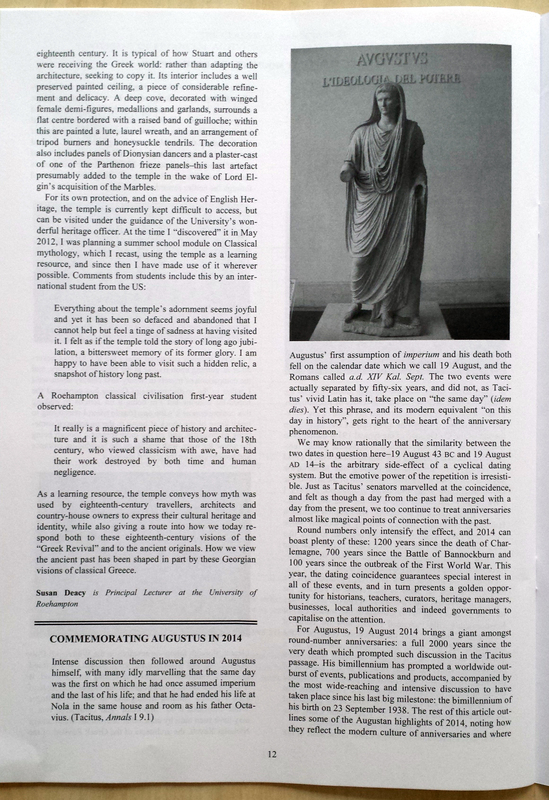 As for the article, if you’d like to read the whole thing, you can take out membership of the Classical Association, which includes a twice-yearly copy of CA News, here. I would highly recommend CA membership anyway as a great way to keep in touch with new developments and events in the world of Classics, and with other people who share the same interest. But obviously I have a particular vested interest in recommending it just now! I’d also like to thank the CA News editor, Tony Keen,for escorting my article into print, and for providing the excellent accompanying image.